Minnie Mouse is a Disney icon, and both young and old know her face and have seen her cartoons. She is one of the more popular Disney characters and her look is often imitated for costumes and parties. While her costume and iconic mouse ears can be purchased at costume shops and at Disney stores, her makeup is little trickier to achieve. However, if you have a steady hand and a few basic makeup supplies, you can complete your look with the perfect Minnie Mouse face paint. Paint the outline of the top of a heart on your forehead with a paintbrush, stopping at your cheekbones. The two swells of the top of the heart should be above the eyebrows. Use the black face paint for this. Paint a curved line from each cheekbone to your ear. 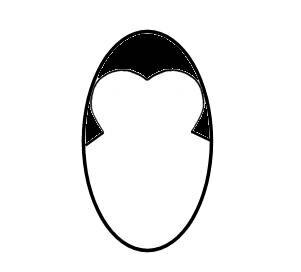 Fill in this heart shape with the black face paint all the way to your hairline. Use the makeup sponge to do this. Paint the tip of your nose black with the makeup sponge. Paint black whiskers onto your cheeks with the paintbrush. Apply a thick coat of mascara to achieve a long-lashed look. Add a black wig, a polka dot dress, and mouse ears to complete this look. If you have sensitive skin, apply a small amount of the face paint to your skin to check for any reaction to the paint.